Final pairing? 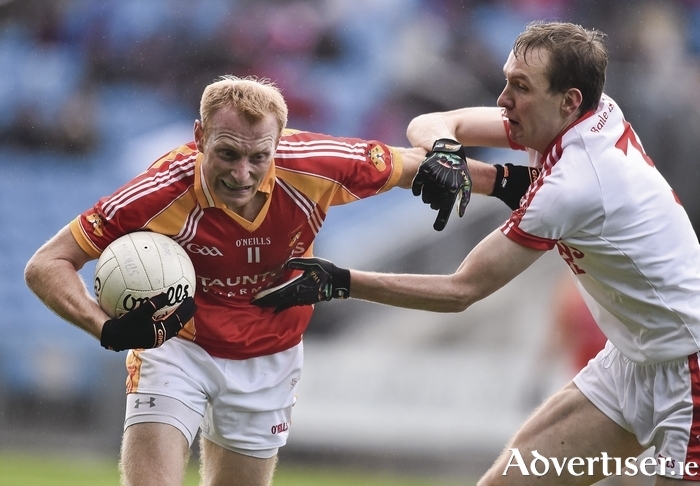 : Will Richie Feeney and Cathal Hallinan be facing off against each other in the Mayo GAA senior football final? Both sides are in semi-final action on Sunday. Photo: Sportsfile. While there's plenty other sporting options to whet the appetite on Sunday, this is the main attraction in the county. Ballintubber have been there and done it three times in the last five years, while Breaffy have been stalking the fringes in recent years, though never being able to get over the line. This game will be a real test of Breaffy's credentials, on paper they have the players to make a real dent at claiming a first ever senior county title this year. But Ballintubber are the masters of this grade over the past number of years and well deservedly so. They play for each other and know how to get things done in tight games and when the chances present themselves are clinical in front of goal. For the neutral, it should be a great encounter with the O'Sheas and O'Connors going toe to toe in this local battle for both sides, while the supporting cast of characters aren't exactly bad either. Breaffy will have to be really tight at the back and, with Michael Hall sitting out the last few weeks with an injury, having him back at full fitness will be key to their chances of shutting down Ballintubber, while the return to action of Liam Irwin and Peter Dravins in attack will be big boosts. But if the likes of Danny Geraghty, Jason Gibbons and Alan Plunkett can get control of the middle sector and feed Diarmuid and Cillian O'Connor and Alan Dillon it will be a tough afternoon for Breaffy to come out on top. If there was any doubts that Knockmore are a different animal when it comes to championship football, they dispelled that last Saturday night with a devestating display in Ballina, putting 5-21 up on Kiltane in their quarter-final win. That statement of intent will have the north Mayo men riding high going into this game, but Castlebar Mitchels are a completely different proposition from Kiltane. The county town men have been going about their business all year in quietly impressive style, they took a while to get going in their quarter final win over Aghamore, but once they got to the pitch of the game they were very impressive. Their midfield pairing of Aidan Walsh and Barry Moran is one of the best at this level, while you throw in the imposing presence of Richie Feeney and Danny Kirby into their front-most attacking line and you can see the quality they possess. But it was the industrious Shane Hopkins who was the star of the show in that win, he finished the day with 1-3 and was a ball of energy throughout, while at the back Paddy Durcan's star continues to rise with another impressive display, with Ger McDonagh also adding a physical presence to their half back line. Of course Knockmore won't care a jot for reputations and they are back in the semi-finals for the seventh year in a row, flying the flag for north Mayo. Their six starting forwards last Saturday night all scored and when the numbers were tallied up they finished with 3-16 between them, with Colm Reape leading the charge with 2-5 by himself, impressive going by any standards. At the back Shane McHale and John Borgan will be looked to, to close things down at the back, while Kevin McLoughlin's engine and football savvy will be needed to keep things moving and unlock the Castlebar defence. Knockmore will not allow a repeat of what happened to them last year, when Ballintubber blitzed them at this stage running in nine goals in one of those crazy games, but they will still probably come up short against a Mitchels side who will feel that a return of just one county title in the last half a decade is a few fewer than they should have on the mantelpiece.